Yesterday, I went into NYC, to attend Ringside Fest 2011! Appearing for the event was CM Punk, Zack Ryder, and Daniel Bryan, signing autographs and taking pictures with the many fans. First, let me start off by saying that it was absolutely freezing yesterday! (http://ryderorriot.wordpress.com/). His responses were, in Ryder fashion, "awesome bro" and "sweet bro". It was pretty awesome in fact. Weeks prior to WrestleMania 27, WWE confirmed that they had come to terms of a contractual agreement with Mexican icon, Mistico to perform on the worldwide stage of WWE. Mistico is known for his legendary high flying prowess and his captivating sensational aerial maneuvers all over the world. From Japan to Mexico, worldwide, Mistico has been a staple to modern day Lucha Libre style wrestling. Cara has been a world renowned box office draw and the equivalent of what John Cena is to the American fans. Some believed it was only a matter of time until the masked crusader would be signed by the WWE. Soon enough, it happened and Sin Cara was born at a press conference at WWE’s headquarters in Mexico City. The presence of Mistico in the WWE is due to one man, Triple H. Cara is the first talent signed under the heir to Vince McMahon’s sports entertainment throne and Cara has also been deemed, “the next Rey Mysterio.” With his aerial specialty and undeniable athleticism, Cara has undoubtedly shown hints of the early days of Rey Mysterio’s Lucha Libre presence in the United States. Fast forward a few months later and I’ve learned one thing….Not any masked luchador can replace Rey Mysterio. Exclusive Interview: Former WWE Superstar, Lance Hoyt talks NJPW, Plans Abrubtly Ending in WWE, and More! When one thinks of a true big man athlete and a tag team specialist with a passion for the business, one can only think of former WWE and TNA Superstar, Lance Hoyt. Working as Vance Archer in WWE for a short stint as well as a long run as Lance Hoyt/Rock in TNA Wrestling, Hoyt has finally found his true home overseas in Japan. Following his last run in WWE, Hoyt moved on to New Japan Pro Wrestling, finding a new passion for the business, like never before. The former TNA Tag Team Champion now brings his sheer athleticism, ability, and passion for Professional Wrestling. Luckily, I was able to catch up with Mr. Hoyt and discuss his career in the United States as well as his new found career in Japan. Another PPV is on the way and I can honestly say once again, I don't care. Hell in a Cell, Bound for Glory, and Night of Champions have all been underwhelming pay per views and that is no ones fault but WWE's and TNA's. WWE especially has been awful as of late, with a lack of producing stars and a lack for clustering so many shows together. It's hard to believe WWE didn't learn how to book a PPV after Money in the Bank's phenomenal increase in buys this past year. Anyways, Vengeance is being revived in WWE for no reason whatsoever....Oh well, it's better than Bragging Rights. Anyways, we are given another John Cena title match and a Big Show match in the main events. That alone makes me not care for this PPV event. Nonetheless, I will preview it and try my best to provide some insight into such a lacking and uninteresting pay per view. WWE Predictability: Why I Am Bored After Every Show! The WWE has been a roller coaster of a ride lately, from good shows, to bad shows. Great feuds were showcased, then all feuds turned bland. This describes the WWE, after having a brilliant summer, to now a disappointment week after week. Now, I am beginning to grow bored with the current product, and for may reasons. If the WWE keeps it up, I will begin to question my devotion to something I've loved to watch for the last four years. Wrestling awards in October? No! However, this is the introduction to the information regarding Pro Wrestling's End of the Year Awards brought to you by your friends at, The Sharp Shooter Press. This article is to provide all information necessary to inform you of the best of the best in the industry in the year of, 2011. 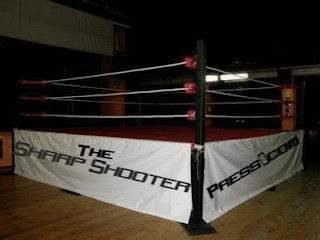 Although we are two months away from 2012, founder and administrator of , The Sharp Shooter Press, DJ Rallo is currently forming a committee of some of the smartest wrestling fans the Internet has to offer in order to converse about all the different awards that Sharp Shooter Press will be introducing and handing out this year. From Pro Wrestling radio show host to writers all over to even some of the smartest Twitter accounts out there, ten of the best minds will come together to form the most in depth awards piece ever presented. Hi! My name is Jeff Awesome, and this is my first article writing for the Sharp Shooter Press. I appreciate being able to be the most electrifying writer in entertainment on this site. I will break down WWE's latest pay-per-view offering of Vengeance. Vengeance needs to live up to its moniker of revenge if it is to stand out amongst the plethora of fall pay-per-views for both WWE and TNA. Normally, I often write fantasy PPV predictions on Bleacher Report. Now, I will write an actual card that I expect to see. I want to assure you that this is not a typo. I actually think Zack Ryder will get a United States title shot at a pay-per-view. After all, we've seen Air Boom vs. Swagger/Ziggler at Night of Champions and Hell in a Cell. 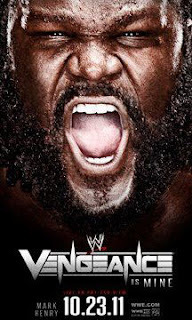 Don't ask me how many times Dolph Ziggler and Kofi Kingston have gone at it. I've never been a big fan of repetitive matches. 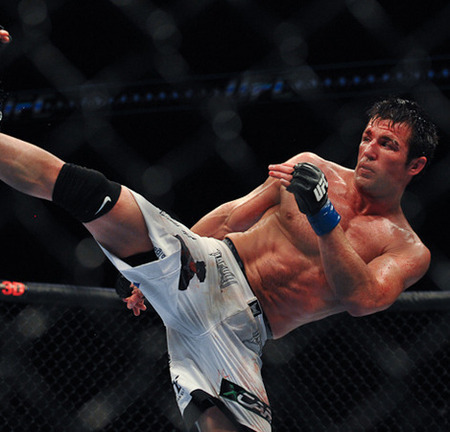 Prior to UFC 136, the notorious loudmouth, Chael Sonnen had been far more quiet than one would expect coming in. Of course, UFC fans alike would notice his charisma and his signs of obvious personality here and there, but not the boastful loudmouth antics we had all been used to. Epic rants aside, Sonnen would be preparing for his big fight with up and coming, Brian Stann. The evening of the PPV event at the Toyota Center in Houston, Texas, Sonnen and Stann would encounter each other one on one in a middleweight bout. Sonnen proved top be quite dominant in the fight, winning via submission in the second round. After this dominance over a talented fighter in, Brian Stann, the post match interview is where Chael Sonnen would really make the event worth purchasing. Having one of the rockiest career paths in recent WWE memory, Bryan Danielson has been revered as one of the best technical Professional Wrestlers in the history of wrestling. Being a submission specialist and knowing the ring, inside and out like nobody else, Danielson made himself known with his unique intensity inside the ring. Before, I really get in depth on this piece, I'd like to give a timeline of all the key events that occurred during Danielson's run as of now in WWE. August 23rd, 2009: Ring of Honor announces one of the founding fathers of the promotion, Bryan Danielson will be heading to the pinnacle of sports entertainment, WWE. January 14th, 2010: Bryan Danielson makes his debut in FCW, WWE's training facility against KAVAL (Low Ki). February 16th, 2010: Renamed, Daniel Bryan, it is announced that Bryan will partake in the premier season of, WWE NXT as one of eight "Rookies"
May 10th, 2010: Daniel Bryan, after losing every single bout on WWE NXT, he captures his first win on Monday Night Raw over Santino Marella. 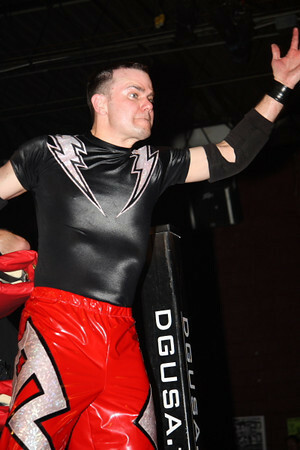 Exclusive Interview: Mike Quackenbush Talks CHIKARA on iPPV, Claudio to WWE, Training Talent, and More! With CHIKARA presenting its first ever, iPPV, High Noon next month, I felt as though it was appropriate to talk to the man behind the organization, Mike Quackenbush. Quackenbush has been world renowned for his in ring ability, mind for the business, and his work as a trainer for some of the up and coming stars of this generation. Earlier this week, I was able to get in contact with Quackenbush to discuss a plethora of topics in regards to his career, CHIKARA's future, and several other topics. Hope you enjoy reading this very informative read! Big thanks to Mike for taking the time out of his busy schedule. Rallo: First off, I'd like to thank you for taking the time to conduct this interview. My first question is going right off the bat with CHIKARA's first ever iPPV, High Noon, which will take place on November 13th, in Philadelphia. Could you tell us, as the patriarch for CHIKARA, your personal feelings in regards to CHIKARA holding their first iPPV event in the promotion's history? What do you believe this means for the future of CHIKARA as a whole for the future? What are you looking forward to the most in regards to the event and what does the future hold for the promotion?